Happy Humpday babes! I don't know about anyone else but we've been having some very spring-like temperatures lately and I'm definitely not sad about it. We definitely had a very mild winter so it's not like I've been missing warmer weather for any length of time but it is nice to have the warm, sunny and most importantly low-humidity days again. The only downside is it is still cool in the mornings and evening so it can be a bit tricky dressing appropriately. This sweater was by far one of my favorites to wear this winter but it's 3/4 length sleeves make it the perfect transition sweater from winter to spring. Over the winter I often paired this sweater with black or regular denim jeans but now that spring is approaching I've been pairing it with white jeans and even shorts on those exceptionally warm days! I think white and camel might officially be my new favorite color combo. I love the color contrast between the two and it's a bit softer than my usual white and black. On another note, over the next few weeks you might notice some changes over here at Sequins + Sea Breezes. Nothing major, but I have been feeling a bit uninspired lately and I thought about taking a bit of a blogger break but then I realized I'm just feeling uninspired writing about clothes. Don't get me wrong, I still LOVE fashion and clothes but instead of talking about my outfits as much I'm going to focus on more of the lifestyle and incorporate my outfits into more lifestyle specific posts. Hopefully I don't lose any followers over the change but in all honesty, does any one really follow me for my superb sense of style (being sarcastic here)? So feel free to leave me your genuine feedback on things, I'd rather have you be honest with me than lose a follower over the changes! Perfect color combo! Love that sweater color! It has been very spring like here. Usually my birthday is cold or wet, but yesterday it was 80! It was so awesome! I love white denim all year around! And those sunglasses are so cute. I like the idea of lifestyle mixed in with outfit posts. I mean you can only talk about clothes so much right? That sweater is super cute. I love how the white pops against it! I think going more in the lifestyle direction is great! Can't wait to keep reading along. Great colour combo and adore those sandals. Your writing style is awesome so do what inspires you! 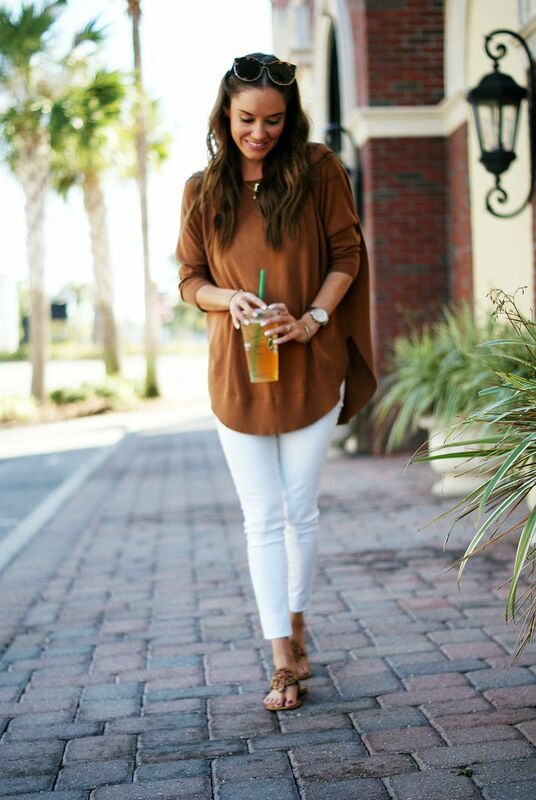 camel and white is a great combo! one i often forget about with my beloved black :) and of course a switch would be amazing! i mean don't get me wrong i will still text you for fashion advice hehe. lifestyle and switching it up is part of the fun! You did a fantastic job transitioning that hazelnut sweater into Spring, Pamela. I love the color of that sweater. Looks fab with white jeans! Love this outfit-- the sweater is one of my favorite colors, such a great neutral! I can't wait to see more lifestyle posts around here too! I can't wait to see more lifestyle posts incorporated into your blog, girl! I doubt you will lose any followers -- I actually gained followers when I started my transition from just beauty to beauty and lifestyle. Loving that top and how perfectly it matches your sandals! perfect with the white! I look forward to more lifestyle posts. This is your space, do what you wanna! I totally agree that the camel and white combo is softer than white and black! I'm loving all of the spring like weather lately too, although it kind of makes me sad since we never really had a winter! Oh girl! This combination is so fabulous! This post has be ready to ditch winter and welcome spring for sure! Oh I love this outfit! I could wear the sweater even being pregnant now. You look gorgeous! And I'll read anything you write, duh. Oh I love this sweater! The color is so pretty too! Loveee this color combo!Excited for what's to come! I've been the same way, and honestly, taking a break from so many style posts has been really refreshing for me. That is my favorite sweater and I have worn mine to death! I need to get this color! Talk about lifestyle, it's the best and I feel like it's such a good way to "know" a person! Can I just say that I am obsessed with this looK! You look so fresh and I love love those white denims! So chic! That sweater is amazing!! I love the color :) Plus with the white its fabulous! I have the same sweater but in a light brown color...the material is so soft! I think the style looks better on you though as I don't typically like high necklines. Camel and white go so well together and the color of TB flats are so versatile for creating so many different outfits. I love this color combo. I need to dig into my closet and see if I can find some camel. Absolutely love this color combo, the sweater is so perfect for those spring days! That sweater is perfect!! I love it with the white, but it's especially gorgeous on you! !